The electric grid delivers electricity from points of generation to consumers, and the electricity delivery network functions via two primary systems: the transmission system and the distribution system. The transmission system delivers electricity from power plants to distribution substations, while the distribution system delivers electricity from distribution substations to consumers. The grid also encompasses myriads of local area networks that use distributed energy resources to serve local loads and/or to meet specific application requirements for remote power, village or district power, premium power, and critical loads protection. 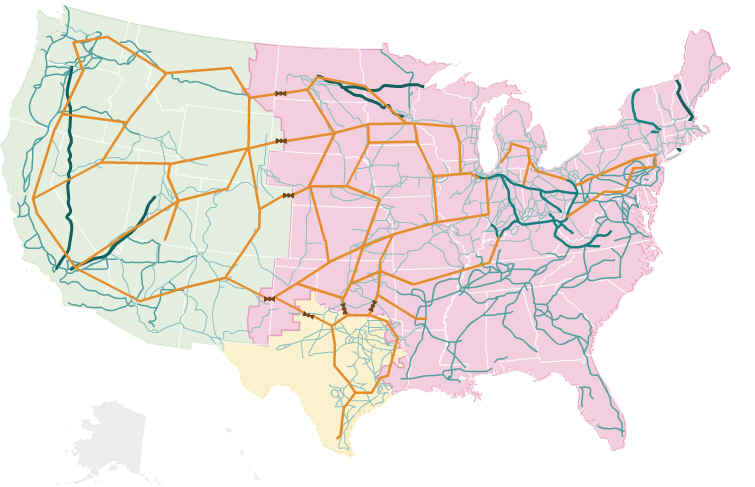 The Eastern and Western Interconnects have limited interconnections to each other, and the Texas Interconnect is only linked to the others via direct current lines. Both the Western and Texas Interconnects are linked with Mexico, and the Eastern and Western Interconnects are strongly interconnected with Canada. All electric utilities in the mainland United States are connected to at least one other utility via these power grids. The grid systems in Hawaii and Alaska are much different than on the U.S. mainland. Alaska has an interconnected grid system, but it connects only Anchorage, Fairbanks, and the Kenai Peninsula. Much of the rest of the state depends on small diesel generators, although there are a few minigrids in the state as well. Hawaii also depends on minigrids to serve each island's inhabitants. Power grids are inherently prone to big blackouts. The United States's electric power grid is growing increasingly complex and interconnected, with a greater number of power buyers and sellers making a burgeoning number of transactions. The U.S. power grid is outmoded, with too few transmission lines to handle Americans' ever-growing appetite for electricity.